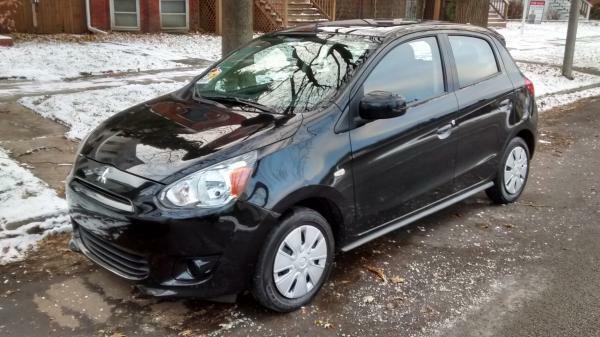 Ahhh, its been just over 1 year with my 2014 Mirage DE 5 speed manual. Its been an interesting year as well, with lots of mods and fun with the car. I'd like to do a recap and share my thoughts on this car as I've used it over the past year. My Mirage just a few minutes after purchasing it. I got the Mirage in December of 2017. I had been watching it on craiglist as the dealer slowly lowered the price more and more. Finally, he dropped it enough, and I went and picked it up one day with Spork (who had been bugging me to get one after she got hers). The Mirage replaced a 2004 Honda Civic DX which I had been driving for the past 6 months. The Civic replaced a 2001 Honda Insight that I had been driving for about 6 months. The Insight replaced a 1999 Chevy Metro (1.0L hatch) that I had been driving (and fixing) for 2 years. I share this because I'd like to give an idea of where I am coming from. Coming from that background, I was very excited to get the Mirage. It fits right in my wheel house of small cars that get good mileage. However, I would like to go over my dislikes and negative aspects of the car first as there really aren't many. I really did not like the handling when I first got the Mirage. I had driven a 2015 that Mitusbishi had loaned me for a week with the CVT. The 2015 had slightly revised suspension vs my early 2014 model. I decided if I was going to daily drive this car, I wanted something a bit more sporty. That is when I went ahead and designed the rear sway bars that I now sell. This substantially changed the way the car handles, and makes it still soak up bumps like a champ, but now it doesn't wallow around corners like a 70s caddy. I still really would like to try out some stiffer springs and I think I'll probably get either a set of Eibach or H&R springs for it come spring time. Other than that, the only repair and/or problem I had was the heater core that I had to replace. The heater core ended up being plugged with some blue gooey substance. It was a cheap fix, but wow it took a long time to do. Now, lets move on to the positive things about the car as there are many. Number one has to be the great fuel economy. I daily drive my car 14 miles to work, and 14 miles home each day on country roads. I hit a max of 50 mph. It is the dead of winter right now and I am getting a very nice 45+ mpg. Granted, I do have several modifications that help increase fuel economy. But, none the less, this is impressive to me. Next up, is the power it has. I know most reviewers nag on this one big time. Its sooooooo slow they say. Well, I don't find myself 'needing' to floor it... ever. It always has plenty of power. If I am flooring it, its just for fun. Is it fast? Heck, no. But, it is plenty fine for daily commuting. That being said, I am working on a nitrous oxide system for it, but that is really just a fun tinkering project. I don't anticipate using it that often. I gotta add this one, because I love to tinker. This car has been awesomely reliable. Its also very easy to work on this car. It been so much fun messing around with and modifying this car. The last car I really spent time doing any real work on was the Metro. About 3/4 of my time was spent fixing the dang thing, and the remaining 1/4 was spent doing fun things to it. It is so refreshing and nice to have a car I don't have to worry about fixing. Initially, I wasn't sure how long I would keep the Mirage. I kept talking to Darin about possibly flipping it and going back to the Insight which I still have. I got a screaming good deal on it, and the possibility of a few thousand dollars of profit wasn't out of the question. Alas, I have kept it and I am very happy with that decision. I look forward to future mods, and more fun with it as I tinker and probably eventually break stuff... and then fix it. My Mirage as I left work yesterday. You can see a list of my current modifications in my garage. But, I'll also list them below for those who can't be bothered to click a link. I'm embarrassed to say that I have your sway bar and glovebox light...but I haven't installed either one of them yet! They're both on the "To Do" list (along with my arm rest) as soon as it warms up. I think you did everyone a huge favor with your heater core work. I'm convinced that every Mirage that's still under warranty not only needs a 4-wheel alignment check, but a test of the heater output temps! Thanks. The heater core was a big job. I still have to get to testing that sludge stuff too to see if there is an easy way to just flush it. So many fun projects, so little time. What's that protruding black round thing on the front under the headlight? Its a plug receptical for plugging in my block heater. I just ordered an engine block heater. Could you tell us more about your plug receptacle? Did you drill a hole to install it? Just installed this in a friend's car... cheap and easy. The current price is $16.95 on Amazon. Yeah, you gotta drill a hole. I think I used a 1-7/8" hole saw. It was a snug fit, I think I had to take a file to it to open it up a little. The listing says to use a 2" hole. Thanks for the info. Not sure I want to cut a hole in front & tap three screws in. I'll have to give that more thought. It doesn't look bad on your black car, however.